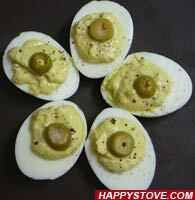 Olives and Mustard Deviled Eggs is a tasteful and quick egg recipe. Serve them as starters or as main course and enjoy the smooth olives flavor mixed with the Dijon mustard hint. Delicious! Hard boil the eggs in rolling boiling water for 8 minutes then remove from heat. Transfer the eggs in a large bowl filled with cold water or change the water within the pot to allow the eggs to cool down. When cooled down, cut the boiled eggs in two halves. With a teaspoon, separate the yolks from the white eggs. Set the white eggs apart. In a food processor, add the yolks, the pitted green olives, a teaspoon of Dijion Mustard and the mayonnaise. Blend until you obtain a creamy, greenish colored, sauce. Fill the white eggs with the obtained olives and mustard sauce. If prepared ahead, refrigerate and bring to room temperature before serving. To garnish your dish, you can top the deviled eggs with some whole Italian parsley or whole green olives. Olives and Mustard Deviled Eggs are a perfect match for steamed asparagus as side.